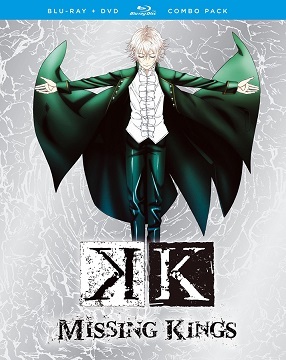 Viz Media released today K: MISSING KINGS as a Blu-ray/DVD Combo Pack and as a Standard Edition DVD Set. The English dub English voice cast includes Sam Riegel as Yashiro Isana, Matt Mercer as Kuro Yatogami, and Stephanie Sheh as Neko. The Blu-ray/DVD Combo Pack is set at $29.98 U.S, $34.99 CAN, featuring full 1080p HD resolution, 16×9 video with character bio gallery and trailers. The Standard Edition DVD is $19.98 U.S. / $24.99 CAN.